Diamond Candles have to be the ultimate gift! 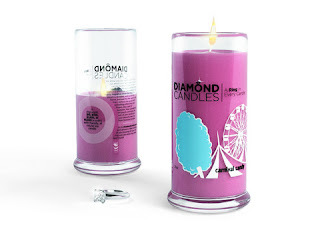 What are Diamond Candles? 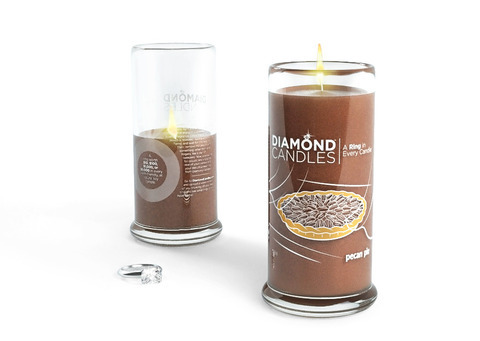 Diamond Candles are amazing soy wax candles. But they aren't just candles. Every single candle has a ring inside of it. The rings are placed into the wax at random, so you never know what ring you'll get! You could get a ring with a $10 value, or you could get a ring valued at $5,000! 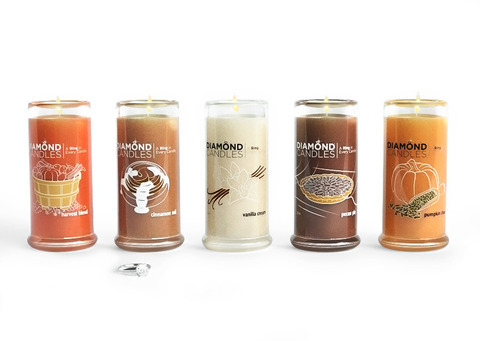 Diamond Candles actually recently released their amazing Fall Scent candles. I was so excited because we always light candles around Thanksgiving. I'm definitely considering a couple more of the Fall Scents, because they all sound wonderful! The fall scents include: Harvest Blend, Cinnamon Roll, Vanilla Cream, Pecan Pie, and Pumpkin Chai. I was able to choose 1 of the candles from the Fall Collection, and I ended up choosing the Pecan Pie. The Pecan Pie candle was absolutely amazing. When this candle is lit, the entire room just fills up with the scent of freshly baked pecan pie. Even when I actually bake Pecan Pie I can't get the scent to fill the room - So I was super happy about the candle. My grandma also loved the scent. We've never had a pie scented candle, and we enjoy it's delicious aroma :)! Now I know what your thinking.. What kind of ring did I get!? Well, sadly my ring isn't worth much. I don't know the exact amount - But on the website it says if it says something like "14k" on the inside then it could be worth hundreds or thousands, but if it says "Thailand" then it is probably worth $100 or less. Unfortunately ours did say "Thailand" so we were able to determine it wasn't worth too much. The ring is still really pretty. 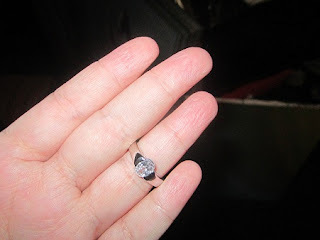 It didn't fit on my finger, but I did fit on my grandma's, so she was happy to add it to her jewelry collection. The ring is wrapped in foil, and in a mini plastic bag, so you don't have to worry about it being covered in wax or anything - It comes out clean as a whistle! 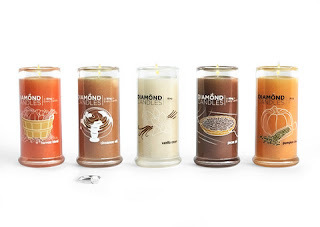 Diamond Candles have an amazing scent collection, and I am definitely doing some holiday shopping from them! And for myself, the Carnival Candy :)! I have to say there is one thing I disliked. That would be waiting for the candle to melt, so I can get the ring out! :p. We let the candle burn in hour intervals, and after about 2 1/2 - 3 hours it was pretty close, so I got out our skinny pair of tweezers, and got it out :)! I love the excitement of not knowing, and I can't wait to get some more Diamond Candles in the future! I plan on getting these for my aunt as well :). I think these will definitely top as my gift to get for people who are hard to shop for! The code word for my blog is the scent that I reviewed: Pecan Pie. I would probably try Dusk! I would love to try the Carnival Candy! That's my favorite. after reading your post:Pecan Pie! I like the Cinnamon Bunn! I really want to try the Cupcake candle. I've heard really great reviews about it! I think Dusk would be nice to smell! I'd love the Carnival Candy scent! Reminds me of the Confectionary at Magic Kingdom! I'm loving the vanilla cream! I have tried the Cinnamon Tea and the Pumpkin Chai already and both are wonderful! But I think I would like to try the Harvest Blend next! Pecan pie is mine & my hubbies favorite pie so i would LOVE to smell that candle. I would love to try the Pecan Pie. OMG so love candle's!!!! thank you for this chance!!!! I think I'd probably like to try the Apple Slice first but then the Lavender Lemon! I would love to try the pumpkin pie! Yummy. I would live ti try vanilla cream. And dusk. It's a toss up between Cupcake and Pumpkin Chai! I would love to try the vanilla cream & actually they all sound like they would smell very good. Yum! Apple Slice please! Thanks! I'd like to try Sweety Pea. I'd like to try the Pumpkin Chai candle. I'd like to try the Strawberry Bliss! I'd love to try Harvest Blend. I'm interested in Harvest Blend! Thanks for doing this giveaway! These sound so good. I would try the Cinnamon Bun and Vanilla. Great Christmas presents for teachers too! I think cinnamon roll would be a good scent. I would love to try Carnival Candy, and the other scents look good too!! I may have to buy one if I don't win, but I really, really hope I do!! So thank you for this awesome giveaway!! I would like to try Cupcake! I would like Carnival Candy!! I would like to try Cinnamon Tea! I'd like to try the Pumpkin Chai. Sounds yummy! I would love the Cinnamon Roll scent. The smell without the calories. yeah! I'd love to try the pumpkin chai. I would like to try the Lavender Lemon. Pumpkin Chai would be my first choice. My favorite scent is Sugar Cookie which they don't have but Pecan Pie is my favorite desert. i want to try the cinnamon roll candle! Thanks for another great giveaway! I would love to try the Cinnamon Roll candle! I would love to try the Pumpkin Chai, I love chai. I'd like to try Sunwashed. Their Dusk scent also caught my eye at Diamond Candles! Waiting to try Vanilla Cream! 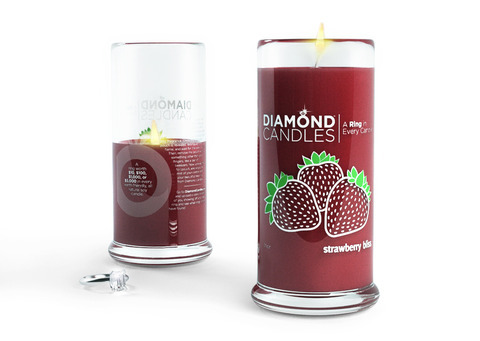 I would like to try the strawberry bliss candle,. I would love to start with the cinnamon roll. I love the smell and actually baked some this morning! I like the Pumpkin Chai. I would like to try the Pumpkin Chai candle. I would love to try the SUNWASHED scent. I would love to try the Pumpkin Chai candle. I'd love to try the Pecan Pie candle. The way you described it, it sounds heavenly! Id love to try the strawberry bliss! Thank you for the giveaway, I think this is an awesome idea! I would like to try the White Chocolate. I'm a sucker for Sweet Pea! Strawberry bliss or cinnamon roll would be my favorite and what I would pick. I would love to try Cupcake!!!!! Or Vanilla Cream! I'd love to try the pumpkin chai scent!!! I would love to try Sweety pea!! I would most love to try the Pumpkin Chai! MMMM! I love love love anything pumpkin and Chai is my fav drink ever! Can't imagine how great this would smell! I want to try the Carnival Candy candle. I want to try the vanilla cream. I would love to try the Sweety Pea. White Chocolate would be my favorite!!! I bet all of these candles smell delish! I love the smell of cinnamon, it actually puts me in a cleaning mood. Seriously! So... I would love to try their Cinnamon Roll. I need to clean!!! I would most like to try the Cinnamon Roll scent. I would love the Cinnamon Roll candle the most. YUM! Cinnamon Roll sounds yummy! I like to try that. So many great scents, but I think I'd love to smell cupcake or cinnamon roll. Definitely Cupcake or White Chocolate - but they all sound amazing! I'd to try the Cinnamon Roll! I like the Harvest Blend scent. My husband loves Pecan Pie at Thanksgiving, and since we are going out of town this year, I won't be able to make it for him, so I'd choose that candle to make our house smell nice! Ooooo I really want to try cupcake! That would be awesome in my kitchen, mmmm! I would like to try the Sunwashed scent. I'd like to try the harvest blend. Definitely want to try pecan pie as it is a favorite pie for my boys in my house.Though they may just think I made them a pie when I light it, lol. Great giveaway. I love burning candles. Thanks. I'd most like to try the Vanilla Cream. I'd like to try the Dusk. I'd love to try the Carnival Candy candle. Thanks for the great giveaway! I'd love the Sweety Pea candle! I commented with wrong account. the harvest blend sounds divine! I would love to try the Lavender Lemon candle!